Accents by Sage Floral Design took care of our wedding floral design at the Carneros Resort and Spa this June, they were nothing short of amazing! All we did was provided photos of how we envisioned our floral design to be, and they delivered exactly what we wanted, but like 100 times better!!! Our wedding planners the team at Tan Wedding and Events had hired Accents for us and we were so thrilled they did! If you want spectacular floral designs I’d hired them any day! 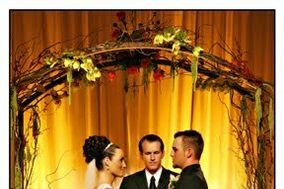 From the bridal bouquet to the Arbor and decor for our kings tables each floral design was a piece of art! Cheryl was probably my FAVORITE vendor to work with while planning my December 2012 wedding! She is such a talented lady and the flower arrangements she creates are stunning. I'm not a very creative person, but Cheryl was able to take a few ideas I gave her and create the most perfect bouquets and centerpieces for my wedding. If you are looking for beautiful and affordable flowers for any event, I would definitely recommend Accents by Sage! Cheryl did such an amazing job on our flowers! She was very kind and helpful. I only had a vague idea of what I wanted. I came to her with only a few pictures of flowers and she was somehow able to create something so beautiful. She was very patient with me and was very helpful with helping me decide how I wanted everything to look. I was overjoyed when I saw the flowers for the first time! They were gorgeous and more than I had expected. Cheryl has such a wonderful vision and does beautiful work. I can't say enough about Natalia and Zac, so easy going and open to ideas. I created a vintage elegance reception centerpieces that tied in with their awesome decor, the room looked amazing and i am so honored to have been a part of their special day! Absolutely amazing, and an awesome value. She did a fantastic job on our flowers, delivered on time, and even stuck around until we were on our way to the ceremony to make sure everything was going smoothly. I would absolutely choose Accents again! Hey Stephanie! Thanks for being an awesome person to work with! I had an amazing time with your choices and loved how smoothly the ceremony went! You have amazing taste! Thank you for choosing Accents! All I can say is that I loved Cheryls work. Everything was great and beautiful! Ring bearer pillow was soo pretty along with bouquets, corsages, boutnierres, centerpieces and the ceremony decorations were lovely! Id hire her all over if I needed another florist. She was on time and didnt miss one thing. Thanks Cheryl:)! Hey Christian! I would like to say that working with you over the course of your wedding was beautiful. Thank you for putting your trust in me by collaborating with you over the course of your wedding. Your choices and design elements were very lovely to work with! Cheryl was unbelievable! We intially were going to do our flowers ourself with a close family friend helping us but it just got to be too much. Cheryl we found at First Distributors in Sacto and we found out later that she actually had her own company doing wedding flowers! She was a diamond in the rough. She made everything look stunning!! My breath was taken away when I first walked into the reception room and the ceremony flowers were just gorgeous. She made it very easy to not stress about flowers. Her experience set my mind at total ease. I would highly recommend her! Krauseheglie! It was great working with you and collaborating together from the colors you have chosen to the variety of flowers! It takes two to bring great ideas to life! Thank you for putting your trust in me! Cheryl did an AMAZING job for our wedding flowers! She is so creative and full of ideas, and when I said I wanted a "winter wonderland" she produced it within my budget! If you have an idea of what you want, but not sure how it will be, she will make it work. She's that good! I HIGHLY recommend using her for your flowers! Elisabeth, it was so fun to put your idea of a winter wonderland theme into play. You came up with some great ideas that helped me put it together. Thank you for choosing Accents! Cheryl was so friendly and responsive. When I met with her I brought lots of pictures because I wasn't exactly sure how to put it all together and I liked several different designs. She walked me through what would work and took her time, On my wedding day I received everything I wanted from the style to the quality of flowers she used. Her prices are fantastic and I referred her to a friend and her wedding flowers were georgeous as well. Cheryl even made a second bouquet for me at no charge for my "honorary" maid of honor and vases for each of our bouquets too! And... she is just the sweetest person. She was a great match for me and I would highly recommend her. Hi there Tina! I was so glad you came to meet with me with different pictures and ideas what you wanted. It was that much easier to work with someone who knows what they want with great style! I am so glad that everything worked out for you, it was a great experience! Thank you for your patience!